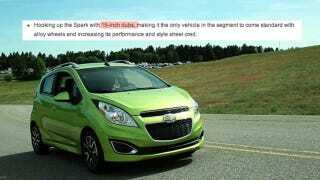 The Chevrolet Spark is a cute car, designed for young buyers. But apparently, GM's marketing department is an older crowd, the kind that goes home every night to watch Mad About You reruns and eat frozen dinners. Check out their idea of "hip" in a press release about the Spark. Hooking up the Spark with 15-inch dubs, making it the only vehicle in the segment to come standard with alloy wheels and increasing its performance and style street cred.